HandKrafted by Stephanie: Taylored Expressions Launch Party! Hello! Welcome to Taylored Expressions launch week! Today is the day that the new web store is being revealed! I just checked it out and it's fabulous! I know you will love its new and improved features that will make your shopping experience even easier! To celebrate the launch, TE will have fun party games and prizes all week long. 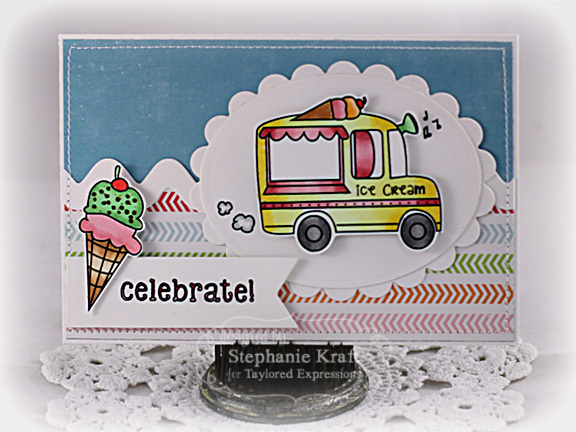 Today, we're kicking off the fun by sharing projects featuring the new Summer Love stamp set. This is an exclusive web launch set available only through Sunday FREE with any order over $20 before tax & shipping (limit one set per customer). I used the Summer Love set to create a 6" x 4" card for my Project Life album. 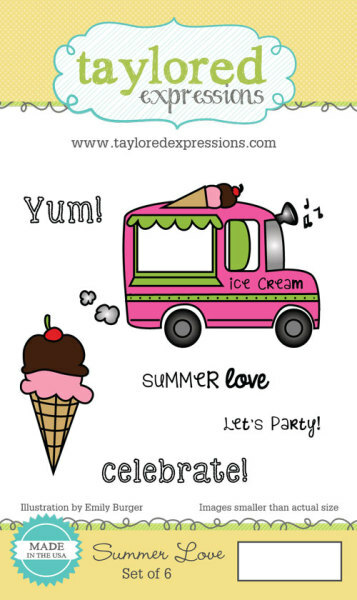 I used the sweet ice cream truck (wouldn't you love to see that in your neighborhood?!) as my main image and also the double scoop ice cream cone as an accent next to my sentiment, "celebrate!". Visit Taylor’s Blog for details on how you can win a $25 gift certificate just for setting up an account and make sure you check out our fresh new look at www.tayloredexpressions.com. Accessories: Taylored Dies: Ric Rac Borders, Banner Stacklets 1 (Taylored Expressions), Classic Rectangle and Scalloped Rectangle Nestabilities - LG (Spellbinders), Markers (Copic), Foam tape, Thread, Sewing machine. Awesome card. Love this set! Fun card! Love the cute papers you've used. A darling summer stamp set! Super cute card Stephanie! I could go for an ice cream cone right about now! Cute! Cute! Cute! Love how you colored the bus! Don't you loooooove this stamp set? Your card is so cute!